During my 35-plus years in journalism I worked with some reporters and editors who left the field and went on to become well known in other arenas. One such person is Carol Beier, who was a copy editor at The Kansas City Times for two years back in the early 1980s. It was her first job after getting a B.A. in journalism from KU…What I remember most about her is that she wore an ankle bracelet and turned the heads of the male reporters in the newsroom. In 1983, she bagged journalism and entered law school. She worked in criminal and civil law for several years, and in 2003 former Gov. Kathleen Sebelius appointed her to the Kansas Supreme Court. She is still there. Another defector was Elizabeth “Betsey” Solberg, a Kansas City Star reporter when I arrived at The Kansas City Times in 1969. Betsey was spunky, effervescent and ambitious. For reasons I don’t know, she bore the nickname Betsey Two Shoes. Her husband, Rick, was a Star photographer. But the person I worked with who made the most startling transformation — at least to me — is Miriam Conrad, leader of Boston Marathon bomber Dzhokhar Tsarnaev’s defense team. I vaguely was aware that she was on the Tsarnaev defense team, but it didn’t hit me hard until today, when I saw a photo that ran with a New York Times story in today’s edition. Here’s that photo. 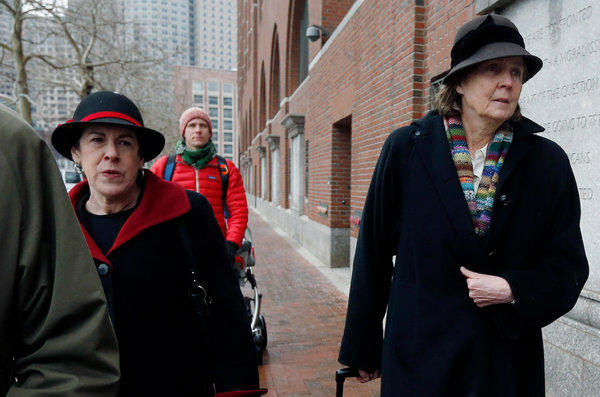 Miriam is on the left (dark hat with crimson trim), and Judy Clarke, an anti-death-penalty lawyer whom Miriam recruited to handle most of the courtroom duties, is at the right. Miriam Miriam worked in Kansas City a year or two in the mid-1980s and then entered Harvard Law School. After law school she went to work for the state public defender’s office in Boston. 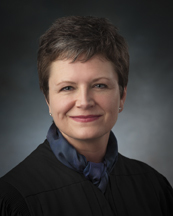 Since 2005 she has been chief of Boston’s Federal Public Defender’s Office, which represents indigent people accused of federal crimes in Massachusetts, New Hampshire and Rhode Island. Tsarnaev isn’t the first terrorist Conrad, who is either 57 or 58, has represented. Previous clients include convicted shoe-bomber Richard Reid and Rezwan Ferdaus, a U.S. citizen serving 17 years for his role in a 2011 plot to bomb the Pentagon and U.S. Capitol with remote-controlled model airplanes. I didn’t get to know Miriam very well. She had come to The Times from the Miami Herald, about the same time that another Herald reporter, Ernie Torriero, came to Kansas City. I did become close friends — and still am — with Ernie, who is an editor at the Voice of America in Washington. What I remember about Miriam was that she was intense, hard-working and gritty. I say gritty partly because she walked with a noticeable limp, the result of a shattered ankle from a 1982 auto accident. In Kansas City, she was always in pain, to varying degrees, from the ankle injury. “Conrad was on her way home from a party at my apartment one night in 1982 when her car struck a median that the Florida Highway Department had installed days earlier with no notice to motorists. Like I say, she was gritty. She’d have to be, not only to go through what she has physically but also to take the slings and arrows that go along with representing some of the most nefarious, cold-hearted criminals to ever walk the face of the earth. Thanks for the memories. But fame is not the same as notoriety. A pet peeve of mine. I turned 69 on Wednesday, and I never realized the distinction until today. Thanks. Fixed. Fascinating stuff, particularly about Miriam Conrad. Wish I could remember her but don’t. I still see Betsey and Rick. Betsey has not retired completely. She is needed at Fleishman Hillard, the Kansas City firm she built from scratch to perhaps the largest public relations firm in K.C. She still keeps her hand in there. She has been on the board of the national headquarters in St. Louis and also established offices in Canada and Beijing. She and Rick renovated the home of the late K.C. artist, Fred James, and live in the Sunset Hill area, south of the Country Club Plaza, not in Kansas. Rick has done well in real estate, still takes his camera on travels, which he and Betsey do together frequently. Betsey was the first woman to serve as chairman of the Greater K.C. Chamber of Commerce and, as you say, headed the Civic Council and other major civic organizations. She is on the board of the Police Foundation, the UMKC Trustees, among many civic commitments. She has certainly done The Kansas City Star proud. I was about 95 percent sure she had headed the Chamber, Laura, but could not find any verification, although I spent a while looking. And when I saw that she had been chairman of the Civic Council, I thought perhaps I had it mixed up. I appreciate the clarification and will add that. Thanks, too, for the overall update — and correction on where they live. I will make sure Betsey and Rick see your blog. Interesting article, Jim. I’m endlessly fascinated by the paths peoples’ lives take. P.S. Happy Belated Birthday! I just got an e-mail from my friend Ernie, who worked with Miriam in the Broward County (Ft. Lauderdale bureau) of the Herald. Ernie came to The KC Times about six months before Miriam. In his e-mail, Ernie said Miriam was frustrated because she was not getting an opportunity to move to the Herald’s downtown (Miami) newsroom. (A lot of reporters used to start in outlying bureaus at metropolitan dailies with the hope of moving “downtown.” Most of those papers don’t have many bureaus any more.) She apparently contacted Ernie, who put her in contact with Bob Samsot, then city editor of the KC Times. Samsot hired Miriam, who stayed in KC before entering Harvard Law School. I’m from Miami but don’t remember any of those names. Thought it interesting that three made the trip from Miami to KC (my reason was family). How long have you been in Kansas City, and do you like it better than Miami? Oh, long enough that I’m pretty much a native — 40 years. I miss the old Miami, not the way it is now … except, of course, for the beach. That’s in my DNA! When Patty and I were first down there about 31 years ago, there were still some of the old apartment buildings/boarding houses on Collins Avenue with orthodox Jews rocking on the porches under fluorescent lights. A few — very few — of the old hotels undergoing restoration, with fresh coats of Art Deco-color paints — pink, pale green, yellow and others. Transformation was in the air, and we were there at the very front end. When we went back several years later, there was nothing left of the old. It was a great transformation, but we love the memory of those old buildings, too. Enjoyed your piece about the three rising stars from KC. Turns out I am in Boston covering the Marathon bombing trial for the LA Times, and have reconnected with Miriam. I was her editor in KC before she left town, and knew she was gifted even then. As to the grim task she has at hand, she certainly is doing the Lord’s work. Best I remember she and you and I were all at Ernie’s California wedding, sometime in the very late 1980s. Readers: Rick Serrano is the federal law enforcement and terrorism reporter in the LA Times’ Washington D.C. bureau. He was a KC Times and Star reporter and editor for at least 10 years before going to the LA Times, also many years ago now. The Times website says Rick has written three books, the latest being “Last of the Blue and Gray,” about the final survivors of the Civil War. Sounds like the newspaper business is as incestuous as the ad agency!